Germknödel are large, steamed yeast dumplings filled with Powidl (a type of plum jam made only of plums – no sugar – which cooks for many to reduce down to a dark purple puree). A delicious sweet dish and all-time favourite served in Austrian ski huts, Germknödel are the perfect treat for a cold winter’s day! 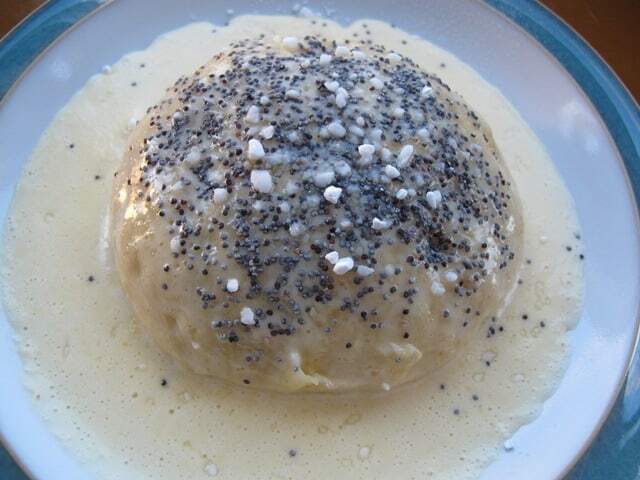 Germknödel are often served with clear butter poured on top, but I much prefer warm homemade vanilla sauce. Finish with a sprinkling of ground poppy seeds and icing sugar. I’ve asked my grandmother for her Germknödel recipe recently so now I’m finally able to enjoy them whenever I want! A delicious family recipe for Germknödel, one of my favourite Austrian winter treats. I use Austrian-made Stroh rum in this recipe to give it its authentic flavour. Combine all dumpling ingredients and knead for about 10 minutes. 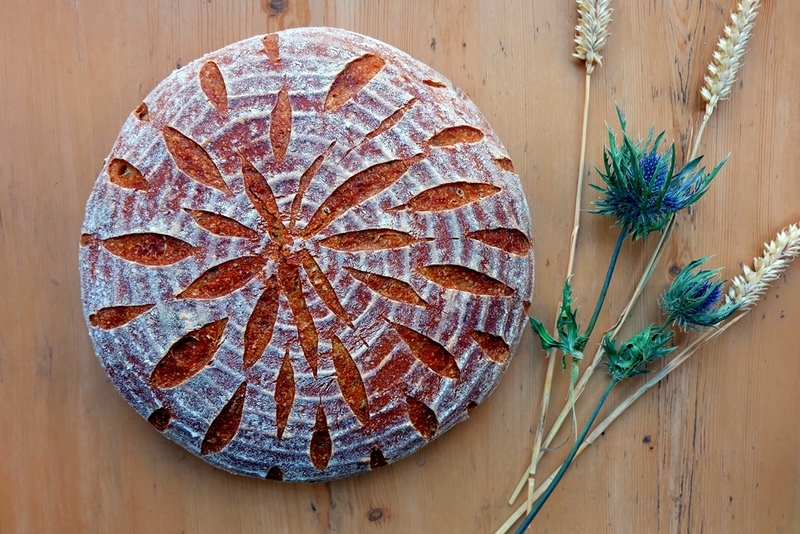 You should have a soft, smooth, workable dough – not too sticky and not too dry. Place the dough in a plastic bowl, cover and leave to rise somewhere warm for an hour or two until it has doubled in size. How quickly the rise happens depends on the temperature in the room, so be patient in case it takes a little longer. In a small bowl, mix Powidl and rum. Lightly flour a clean work surface and turn out the dough. Punch down the dough, form the dough into a sausage shape and divide into 10 pieces with your dough scraper. Flatten each piece with your hand. 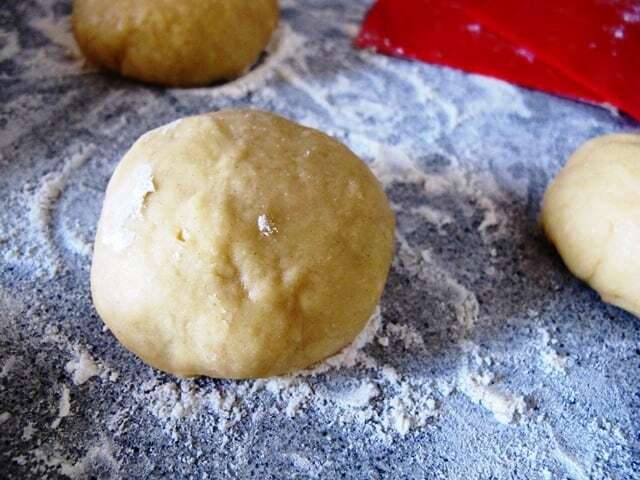 Place a teaspoon of Powidl mixture into the centre of the flat round dough piece. Bring up the sides of the dough around the plum jam and seal well by pinching the edges. Place each dumpling onto the floured work surface or baking sheet, cover with a dish towel and leave to prove for about 30 minutes to 1 hour. The Germknödel should have visibly risen before you continue. Prepare the vanilla sauce while you wait. Bring a large pan of water to the boil and use a steamer (I use a bamboo steamer) lined with baking paper to steam the dumplings for 15 minutes. 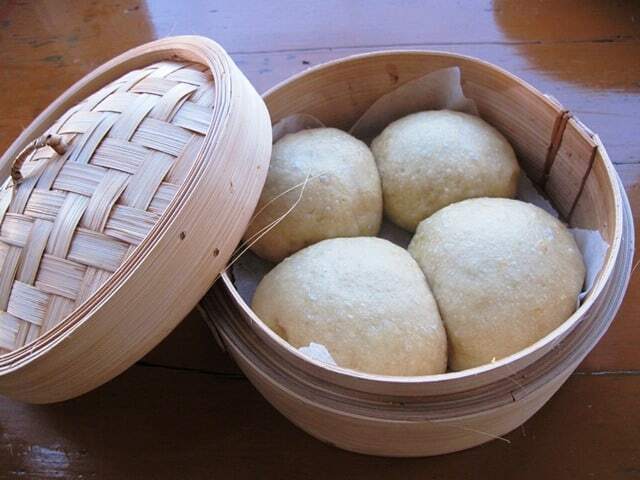 I can fit four dumplings into my steamer at a time. Make sure you cover the steamer with a lid. If you don’t have a steamer, you can use a cotton dish towel which you put over the pan. Secure it with twine and make sure the cloth isn’t exposed to the heat source. Place the dumplings onto the cloth and cover with a second pot. Serve and enjoy straight away. 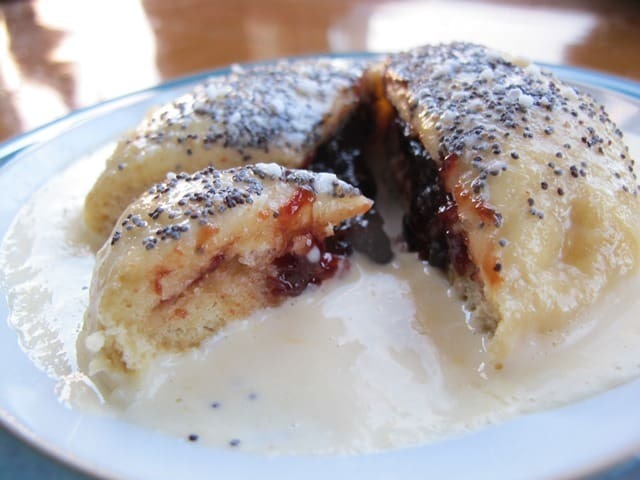 Pour over hot vanilla sauce and sprinkle with a mix of ground poppy seeds and icing sugar.